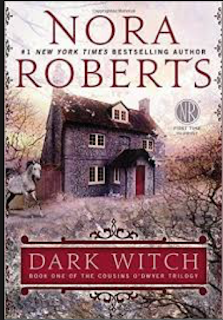 Dark witch is the first book in a series of three books By Nora roberts. The name of the series is the Odwyer Series. It takes place in Cong County Mayo Ireland which is where the Quiet Man starring Maureen Ohara and John wayne was Film.. The Books are about three witches, their families and Evil of Course. The first Book is about the Lovely couple Iona Sheehan and Boyle McGarth. Iona is american cousin to the Ireland O'dwyers, Branna and Conner, through her Grandma. She finds out through her grandmother that there is Magic in the family. She goes to Ireland to meet this family but really finds what she desire most in life, a deep close knit family, In Branna and Conner. Branna Helps her gain a Job working for Boyle McGrath at the Local Horse Academy for young riders. In dealing with the Horses, Iona seems to have a very magical gift about her, Boyle notices this and so he hires her on the spot..
Iona is immediate attracted to Boyle and the whole area around, But she thinks he has a girlfriend. She eventually learns differently and they fall for each other.. As the story goes on Iona also learns more about the family legends and the Evil Male witch that has been around for centuries. This first book carries a lot of the old Irish charm and magic in it.. Nora Roberts is always great at bringing the Irish loving charm out of her magick book series but this series seem to not only have the usual romance from her but also Mystery and suspense of will they defeat this centuries old evil or not.